The protests depicted in this collection took place between November 29, 1999 and December 3, 1999, when the World Trade Organization (WTO) held its ministerial meeting in Seattle. This collection of images was chosen to illustrate both the diversity of the protests and the mobilization efforts that brought so many activists to Seattle. The WTO has often been criticized by a broad range of political activists; including labor, environmentalists, pro-democracy, and human rights advocates. All of these groups have documented what they view to be abuses supported by the WTO's trade practices. 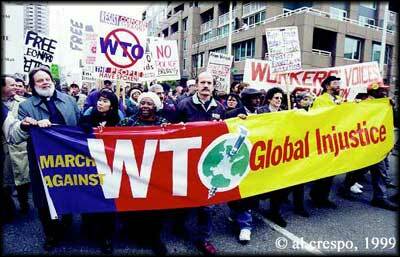 Although both Seattle and Washington State authorities expected some organized protest to the WTO ministerial meeting, few were prepared for the scale of the protest that occurred on November 30, 1999. The previous day had brought small, peaceful protests. The morning of November 30 was a different story. Protestors in the street forced the delay of the WTO opening ceremonies. Further problems developed when youthful, out-of-control, self-proclaimed 'anarchists' joined the more serious WTO-focused protestors. By early afternoon, the unprepared Seattle Police Department (SPD) ran low on tear gas, bus service was suspended downtown, and many businesses closed their doors. The Clinton administration ordered that either the protestors be controlled, or the government would cancel the WTO meeting. Seattle mayor Paul Schell declared a State of Emergency and ordered a curfew in downtown Seattle, among other measures. The National Guard and the Washington State Patrol were also called in to help maintain order. Police were ordered to clear downtown crowds, and forced their retreat to Belltown and lower Capitol Hill. During this forced retreat many businesses were vandalized by 'anarchist' protestors. The next day, December 1, was calmer, but many downtown businesses were once again forced to close, to repair the damage from the previous day. Determined not to let the crowds run out of control again, 504 protestors were arrested amidst reports of police brutality. Television news was saturated with coverage of the 'Battle in Seattle'. December 2 was calmer still, perhaps because so many protestors had been jailed, and also because the focus of the protests changed. Protests were no longer centered on the WTO, but against the SPD and their treatment of the protestors. By the end of the day, many of the emergency restrictions were relaxed. December 3 brought the WTO closing ceremonies and the gradual return to normalcy in downtown Seattle. Bus service was restored, except on two streets. Businesses continued to repair their damage and reopen, and business owners publicly criticized Mayor Schell and the Seattle Police Department. Many believed that most of the problems could have been avoided, had the city and the police been better prepared for the protests, instead of reacting to them. This collection includes references to meetings between police and protest organizers in which the police were notified of the expected scale of the protests. The protests had many far-reaching results in Seattle. Popular opinion is divided on whether the police department or Mayor Schell was responsible for the mishandling of the event, but on December 6, 1999, SPD Chief Norm Stamper took full responsibility for the debacle, and tendered his resignation. Within two weeks of the protests, the Seattle City Council heard 18 hours of testimony from witnesses, which led to an ongoing investigation of the events by the newly appointed WTO Accountability Review Committee. On November 30, 2000, many of the protestors returned to Seattle for an anniversary protest. While this protest was far milder than the original, there were still 140 arrests in this rehash of the previous events. In September 2001, Mayor Schell was the first incumbent mayor in 54 years to be defeated in a primary election. Go to The WTO History Project, for more information about the days of protest, from the protestor's point of view. PLEASE NOTE: The WTO History Project site is no longer being maintained but is still available for its historical value. Or look at www.cityofseattle.net/wtocommittee for the results of Seattle's WTO Accountability Review Committee. PLEASE NOTE: The WTO Accountability Review Committee site is no longer being maintained but is still available for its historical value. HistoryLink, www.historylink.org, also has additional information, including detailed, hour-by-hour timelines of the protests and police mobilizations. This project is the result of collaboration between the University of Washington Libraries Special Collections Division, the University of Washington Libraries Digital Initiatives Program, the Harry Bridges Center for Labor Studies and the Center for Communication and Civic Engagement. More information about this project and the materials can be found at The WTO History Project website.